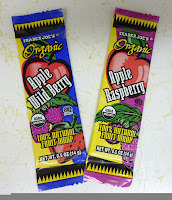 I used to love those fruit roll-ups that were so popular in the 80's and 90's. They were the epitome of "fun food." And then Betty Crocker started doing crazy stuff with them like fluorescent colors and little shapes you could punch out of the sheet, and things just started to get out of control. After kids had stuck the roll-ups over their eyes, punched out the little shapes, and played with them on the table, the fruit was covered in a thin layer of dirt and little fuzzies. It was kinda gross and we all knew it, but the roll-ups still tasted good, so we shoved the bits of flattened fruit puree into our mouths, along with the millions of microbial invaders that had hitched a ride on the roll-up and our sticky hands. I figure it just strengthened our immune systems in the long run and perhaps prepared our bodies to fight off H1N1 and other such modern-day calamities. Flu vaccination? Please. I've eaten fruit roll-ups off an elementary school classroom floor. My white blood cells can handle whatever the swine flu has to dish out. And I also figure that eating more organic fruit can't hurt in the ongoing battle against viruses and germs. That's one of the many reasons I wanted to check out these fruit wraps from TJ's. Pretty much the entire ingredients list is fruit purees and fruit juices. Au naturel. And maybe it's my slightly more sophisticated palate, (it really hasn't changed that much since I was 8) but I think these taste way better than those old Betty Crocker fluorescent deals I used to peel off the plastic sheets in third grade. I'm not totally sure why they're called "wraps," either. They're not wrapped around anything, they're just thin layers of fruit. I think people used to call this kind of thing "fruit leather." Maybe Trader Joe's wanted to steer clear of the whole inedible cow-hide theme entirely, so "wrap" seemed more appropriate. At any rate, they're very fruity and they're incredibly moist. When you open the package, they're completely coated in a layer of what would appear to be apple juice—it wouldn't be much different if you dunked the entire wrap into a glass of fresh apple juice just before eating it. But no complaints there. You can hold the whole thing by the wrapper while you eat. No need to get your hands all sticky. All the flavors I've tried are really good. There's not a whole lot of variation in the taste of each kind, but you can tell some difference. They're chewy, soft, and sweet. They do stick to the roof of your mouth and teeth sometimes, but you'll get that with fruit leather or whatever you want to call it. Another solid, healthy snack offering from TJ's. Double 4's.